Welcome to a new Rotary year! This week marks the first week of our new Rotary year. At the most recent Rotary international convention in Seoul, Korea, Rotary International President John Germ said that this could be the greatest year ever in Rotary history. With only 17 cases of the wild poliovirus in this calendar year, we are on the verge of ending polio forever. How incredible that this could very well happen during the year we celebrate our Rotary Foundation's centennial. Arch Klumph envisioned an endowment for doing good in the world at Atlanta's 1917 convention. 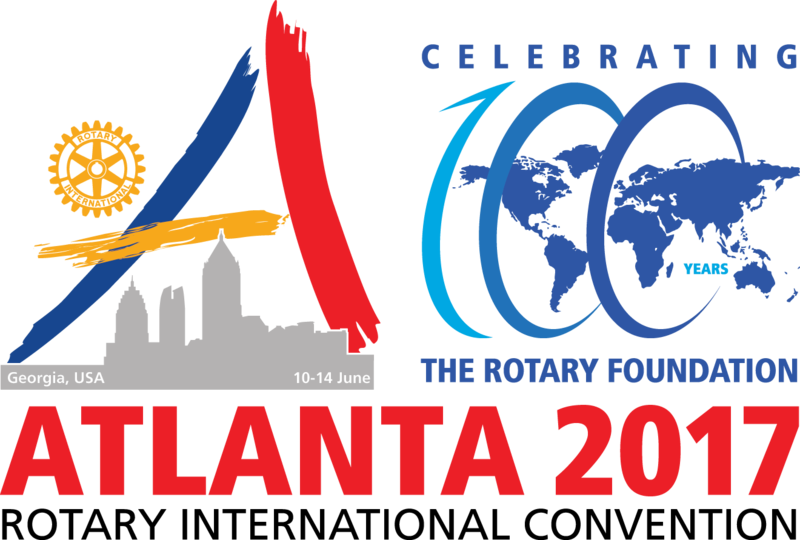 We will welcome Rotarians from all over the world in Atlanta June 10-14, 2017, celebrating 100 years of Our Rotary Foundation. 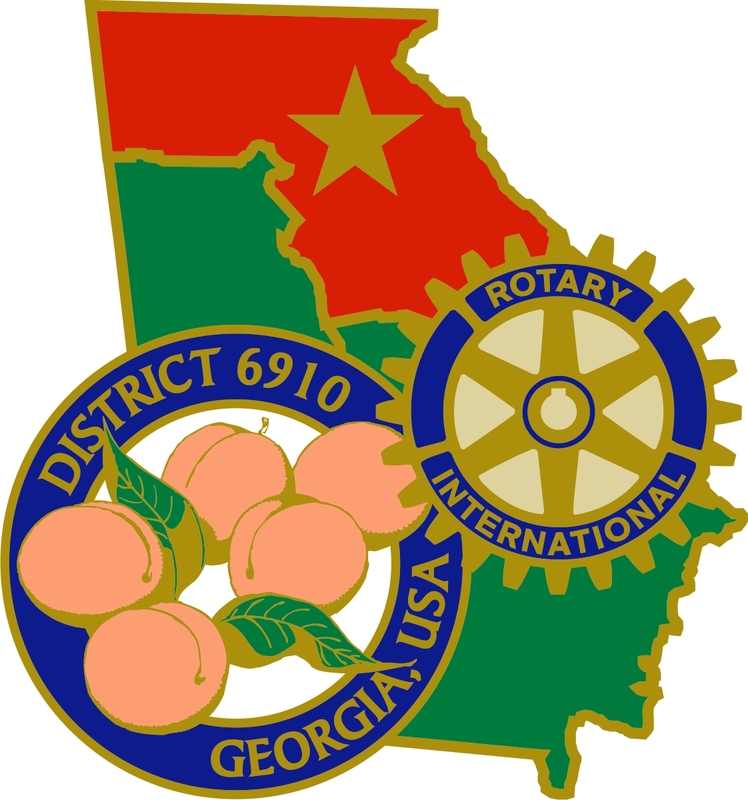 We in District 6910 are one of three host districts in Georgia, and together we have been preparing for several years to welcome the world to Atlanta. To date, we have over 20,000 people registered for the convention, and we could very well see record attendance numbers. Of course, we will need a large number of volunteers. I hope you will be one of them if you can. You can volunteer and register here. Note that you must reserve your hotel rooms through this site as well, since Rotary has blocked out the rooms in Atlanta for this time period. We have a number of ways to mark and celebrate our Foundation’s centennial. 100% Paul Harris Fellow Club - To commemorate our Foundation’s centennial, District 6910 is working toward all 73 clubs becoming 100% Paul Harris Fellow clubs prior to the convention. If your club is working toward this, I would suggest setting a goal deadline such as March 31, 2017 to make sure you're there by June 2017. Our District Foundation Chair, Bill St. Clair, is spearheading this initiative, and has a team throughout the district ready to help your club achieve this recognition. Seek to increase your club's giving to our Annual Fund by at least 10%. What we are able to do in our local communities is only determined by how much we are willing to give. #100ActsofGood - To mark the Rotary Foundation centennial, members everywhere are encouraged to do 100 acts of good throughout the year, letting others know by posting photos of yourself on social media, along with a brief description of the act using #100actsofgood. Clubs are encouraged to complete a special community project commemorating the centennial or in honor of the centennial. Promote your centennial events and projects by contacting local media and using #TRF100 on social media. Also, list your projects and events on Rotary Club Central and Rotary Showcase for even more exposure. Our House of Friendship at our District Conference in Chattanooga will also highlight the centennial projects of our District 6910 clubs. The Centennial Million Dollar Dinner will be held on June 9, 2017 at The Georgia Aquarium in Atlanta, with Rotary International John Germ as our keynote speaker. Guests are those who have made a new gift of $10,000 or greater to The Rotary Foundation in the form of an outright gift or a bequest. Rich Panyik is the person to contact if you're interested in learning more about how to become a part of this exciting event. Registration will open July 7 for our District Conference that will be held on October 7-9 in Chattanooga. My husband, David, and I will host a river cruise dinner aboard the Southern Bell on the Tennessee River for all club presidents, assistant governors and district leadership (and spouses/significant others) on Thursday evening, October 6 to kick off the event. Someone asked me last week who attends District Conference. My answer to that is "Everyone!" I hope you will plan on being there. We have secured a great rate of $149 for hotel rooms at the Chattanooga Downtown Marriott and we have an inspiring lineup of great speakers. For a limited period of time (from July 7 until August 8), registration is just $185. I hope that you'll not only register yourself, but your spouse or signifiant other as well, as our speakers are sure to entertain, inform and inspire both of you. It's a holiday weekend, so you might even want to stay until Monday. Please also mark your calendars for our Pillars of Success Seminar. It will be held on Saturday, August 13, 2016 at Lanier Tech's Forsyth Campus. Everyone is welcome, but it's especially important that your club leadership is there, including your membership team, your public image team, and your Rotary Foundation team. Regarded as one of Rotary's top trainers, RI Director Brad Howard of Oakland, California is our featured keynote speaker for the event. My primary role is to support you. I'm here to help your club achieve and exceed its goals and celebrate your victories. Speaking of which, we will celebrate these achievements on May 13, 2017 at District Assembly, including Club of the Year and Leadership Awards. The Club Awards Points listed in the District Directory & Guidebook and The Presidential Citation are meant to help guide you and motivate you throughout the year. Our Awards Chair, Marvin Kliman can help with questions on club points. Together, as a team in District 6910, we are out to change as many lives as we can for the better. We are Rotary Serving Humanity. We in the Rotary Club of Canton are ready to help you make 2016-2017 -- the year of The Rotary Foundation's Centennial, the Rotary International Convention in Atlanta, and the Canton club's 80th anniversary -- the best year ever in Rotary District 6910!